African Greys and other birds are able to control their irises and you can see their pupils rapidly enlarging and shrinking. This is called "pinning". Eye pinning goes along with what is happening in the immediate environment and body posture. If your African Grey's body is relaxed and its eyes are pinning it usually means they are interested in or concentrating on something. However, if your African Grey's feathers are puffed out and their eyes are narrowed and pinning – watch out! They are angry or frightened, and if bothered will probably bite. Below is a short clip showing "pinning", do take note of the pupils of the eye. Your African Grey will wipe its beak after eating - on its perch, cage, your shoulder, wherever it may be at the time. A soft grinding noise where the African Grey slides its lower mandible (beak) and tongue against the upper mandible. Beak grinding is a sign of contentment and is usually heard as your African Grey falls asleep. Some experts believe that African Greys and other birds grind their beaks to keep them in good condition. African Greys love to chew and destroy things. It is not just for the entertainment factor, but also to condition their beaks. Provide many toys – see our page on Toys – to keep them from being bored. An African Grey Parrot will growl when it is frightened. Make sure there is nothing in their environment that could be bothering them, if so, remove it. It is common for an African Grey Parrot to shake its head or yawn. This could be because it is tired and really yawning or it could be because it has something like a seed or piece of food stuck in its esophagus. African Greys do sneeze. And not just to imitate their humans! You will also see them stick their claws in their nares (nostrils) which dislodge feather dust and particles. Contact your avian vet if you see a discharge from their nares. If your African Grey Parrot pins its eyes, bob its head, stretches out its neck and then regurgitates, they are showing you love and affection. It is trying to bond with you. African Greys and other birds in the wild feed their young this way and breeding pairs also do this as part of bonding. African Grey Parrots often sleep with their heads tucked under their wing. African Greys and other birds "preen" their feathers. This means they clean them by taking each feather and sweeping their tongue along it. You will also see them rub their heads against the base of the tail. This is where the preen gland is located and an oil is emitted that they will then rub onto their feathers. 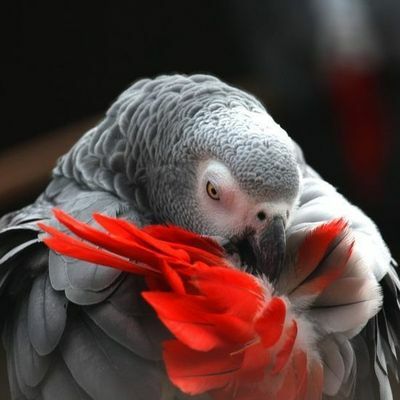 Below is a picture of African Grey preening. Your African Grey will fluff its feathers when it is relaxed, as a way to relieve tension, if it is cold, and even during the preening process which helps it to remove dirt or feather dust. If your bird remains fluffed for a long period of time and is unusually quiet, fluffing can also be a sign of illness and you should contact your avian veterinarian. When African Grey Parrots are afraid, they will flatten their feathers. An all over trembling body means your African Grey Parrot is afraid of something. This is usually accompanied by wide, staring eyes and deep breathing. Unlike the entire body quivering, if your African Grey's chest only is quivering, they are feeling emotion. Some experts believe it means a sign of happiness and contentment. An African Grey is asking to be petted or scratched when they bow with their head tipped downward toward you. African Grey Parrots will "chicken scratch" at the bottom of their cage or on the carpet. This is a normal behavior for them as in the wild, they do this to loosen dirt and mud. African Greys are very relaxed when you see them standing on one foot with their other foot tucked under its breast. African Grey Parrots love to hang upside down. They will do this when happy and content, and of course, playing with their toys! Flapping their wings, or flying in place, is a great form of exercise for your African Grey. It can also be used to get your attention or just to display happiness. African Greys and other birds often lift their wings as a means to stretch or to cool themselves off.